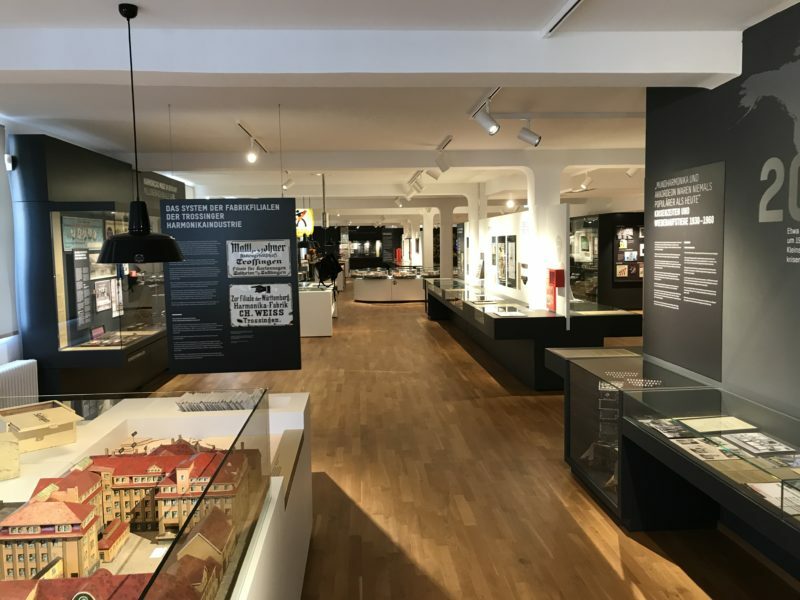 The new permanent exhibition, presented in a space covering some 600 square metres, can be regarded as the heart of the museum. It offers a comprehensive and entertaining overview of the 200 year history of the harmonica and the accordion (how young these instruments are! ); naturally with reference to their predecessors. The generously and professionally arranged exhibition is organised around various focal themes and with emphasis on the use of multimedia. Visitors are encouraged to try things out. 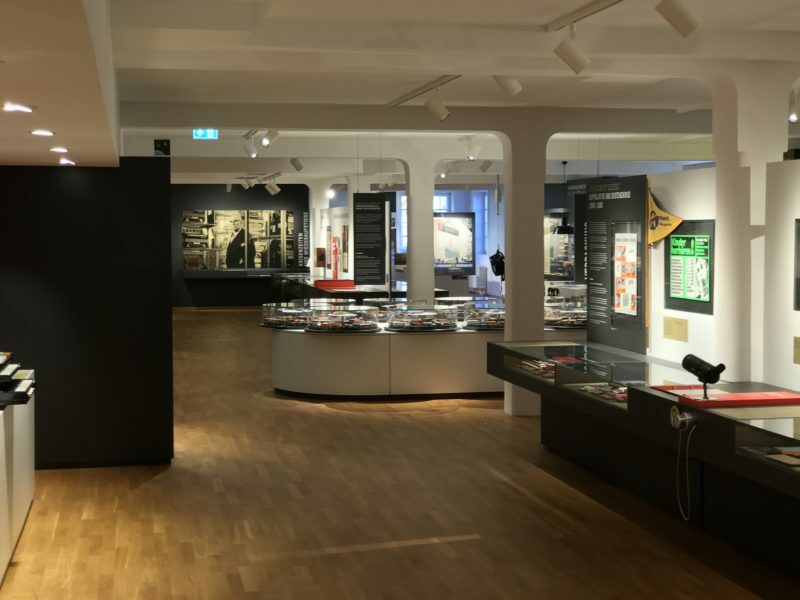 Pull-out displays and loose-leaf books contain further exhibits and in-depth information. This is the title of a special zone where the exhibition begins – and ends. 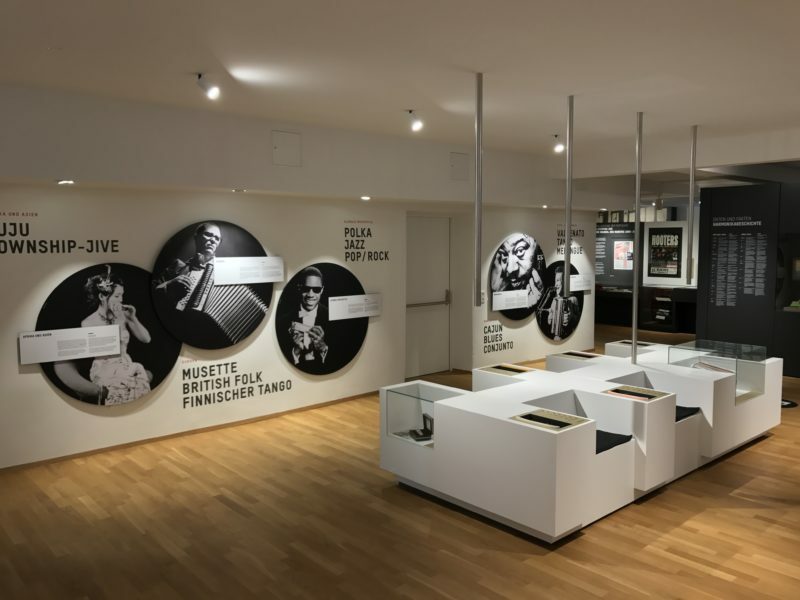 Here you can listen to a selection of music titles before and after your tour of the exhibition. You will be surprised how many music styles from around the word have been influenced by harmonica and accordion instruments. 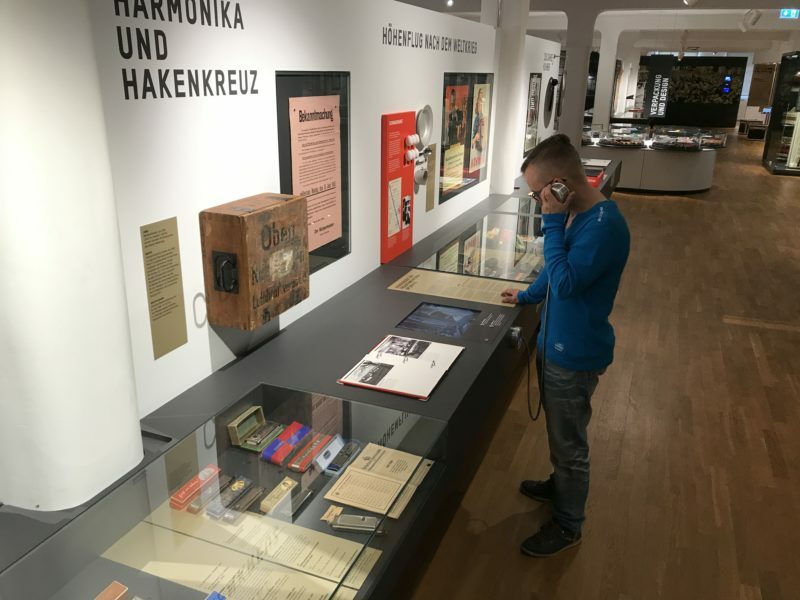 The audio experience at five seated listening stations equipped with headphones has proved very popular with our visitors. 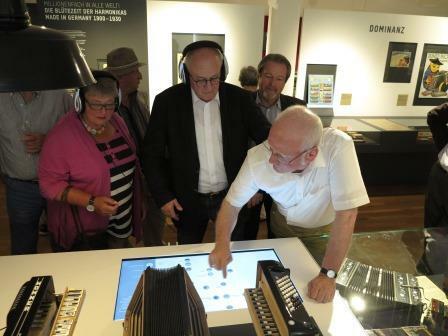 For visitors taking part in group tours the samples of music are presented in louder volume. This is possible at all media stations. 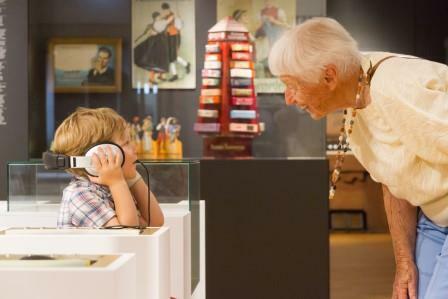 The permanent exhibition has attractions for both older and younger visitors. Photo: Miriam Vosseler. 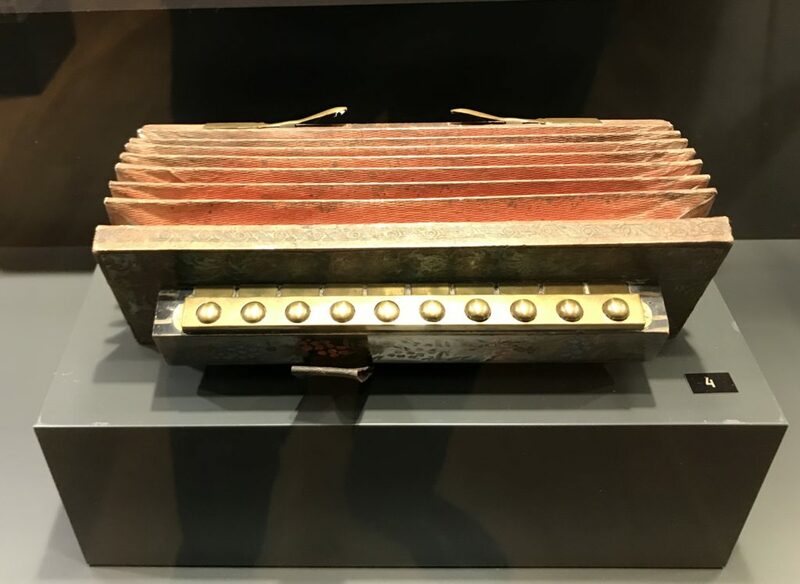 Just a few, but nevertheless outstanding exhibits such as the oldest hand-held harmonica from Viennese production (the first "accordion" was patented there in 1829), document the development of the earliest musical instruments with a so-called free reed. This main section - subdivided into 5 time periods – forms a golden thread through the whole exhibition. 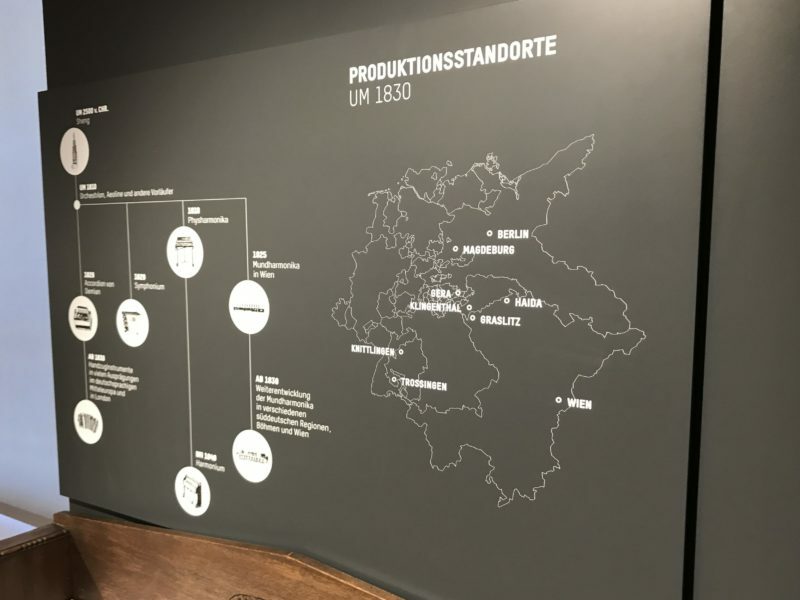 At the centre is the “Hohner Story”, but always in relation to the global competition. 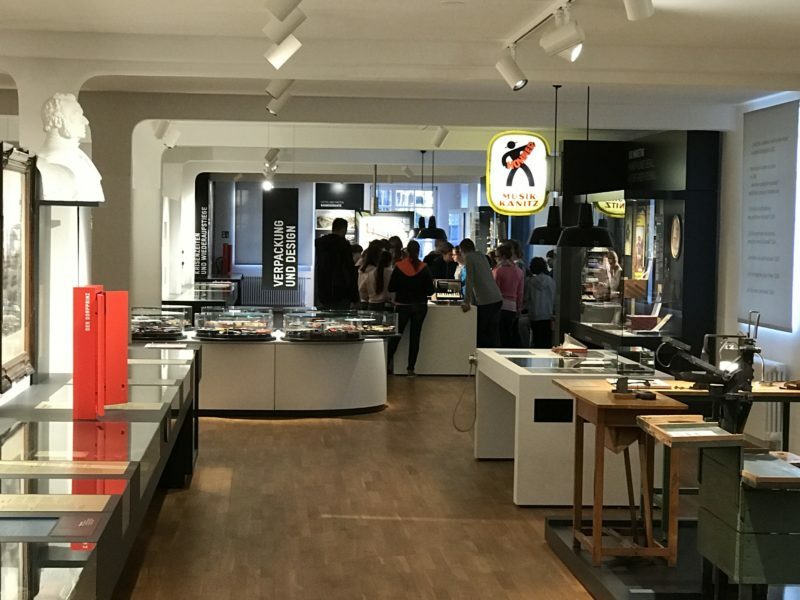 Important special-interest displays and zones (items 4. to 7.) complement the narrative thread. All possible aspects of social, economic and manufacturing history are touched upon. These are documented by many hundreds of interesting exhibits, including precious unique items. 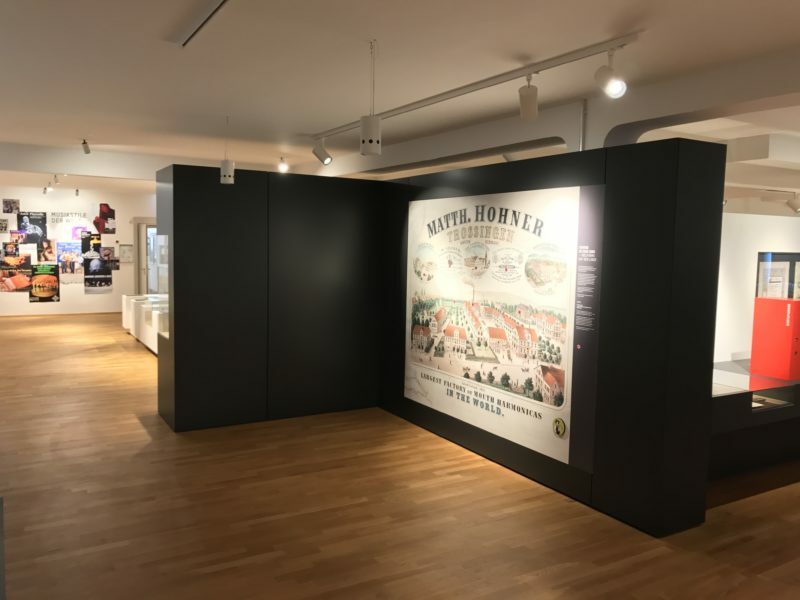 The most original stories and exhibits are highlighted using red building elements, the “anecdote boxes”. 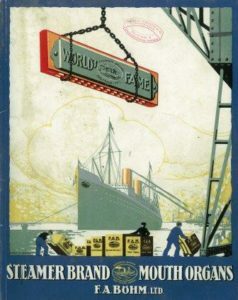 The industrialisation of the branch (1850 – 1900) is symbolised in the poster entitled “Erika”, that company founder Matthias Hohner used for his global marketing. The ivory mouth organs designed by Wilhelm Thie and manufactured in Vienna are particularly precious. Hohner was keen to reproduce the high quality of this company’s products. 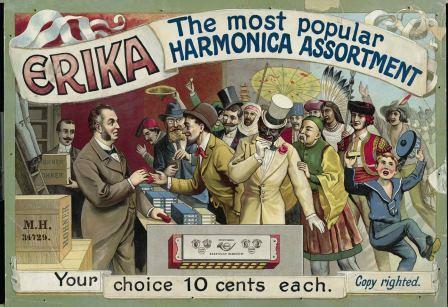 The golden age of harmonicas and accordions made in Germany (1900 – 1930) takes up a large sub-section. This is dedicated not only to the further rise of Matth. 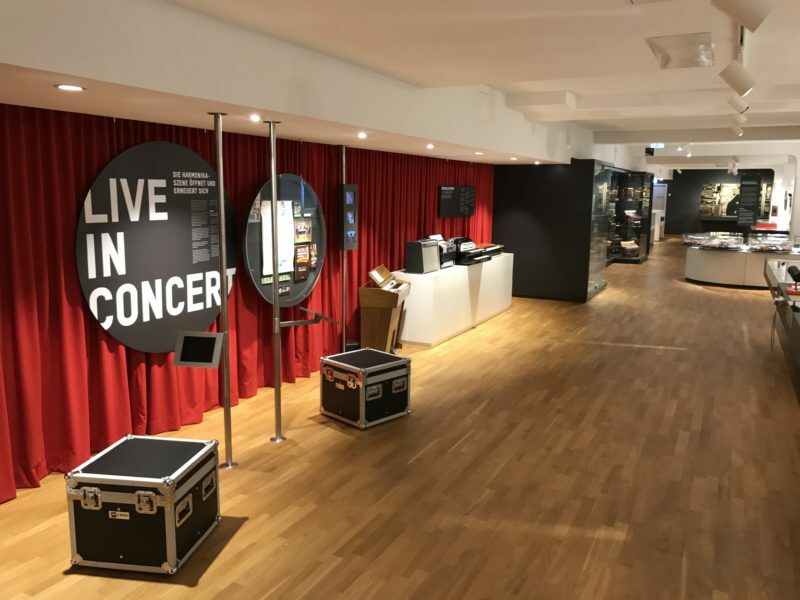 Hohner AG to become the dominant manufacturer. 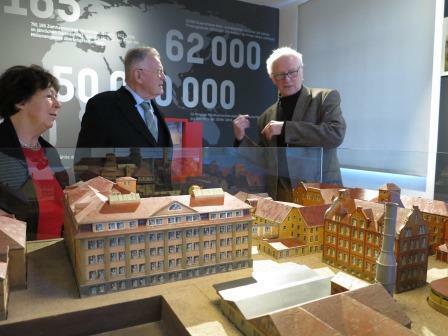 It also depicts in detail the once-famous harmonica industry of Saxony and Thuringia. 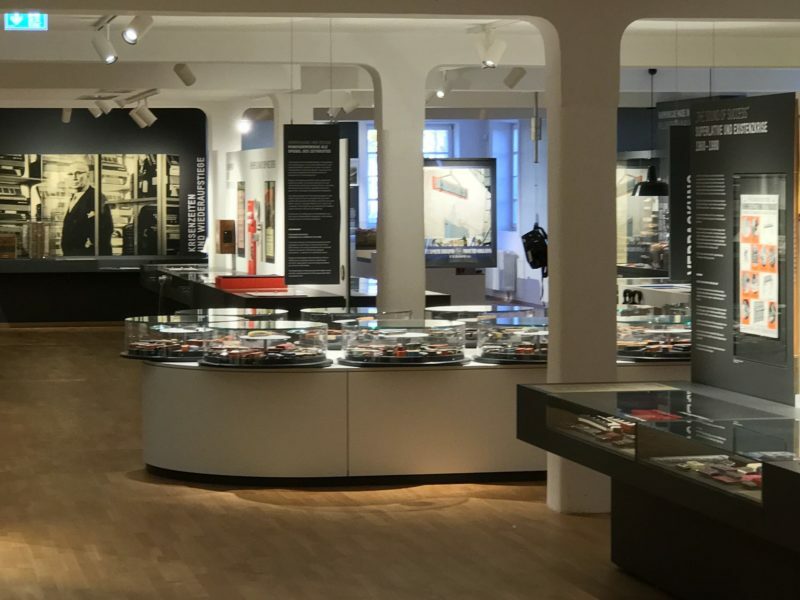 A further special-interest display takes us to the history of the building and the expansion of the Trossingen harmonica and accordion industry into the region, as around 1900/1910 dozens of branch factories were founded. The original poster with a view of the factory from 1925/26 and a painted wooden model of Works 1 of Hohner AG are a double eye-catcher. Catalogue advert of the former company Böhm of Klingenthal, presented in large format. Representing the golden age of the mouth organ is the greatest star of the 20th century, Larry Adler, who conquered the stage with his Hohner-Chromonica and made the “mouth harp” respectable in good society. One of the audio stations is dedicated to Adler, the “Paganini of the mouth organ”. The “Schwabentreue” (Loyal Swabian) mouth organ is a spectacular exhibit shown here shot to pieces (!) It saved the life of a Swabian soldier in the great war. 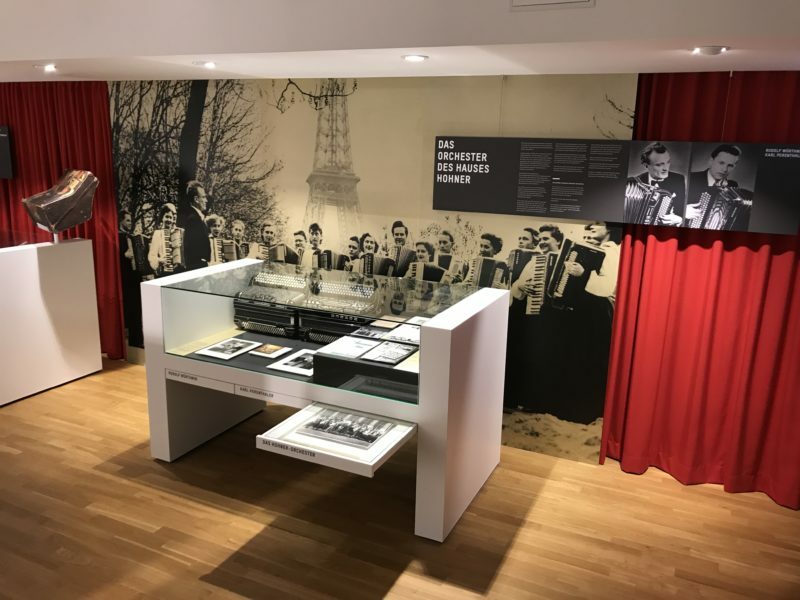 Times of crisis and resurgence (1930 – 1960) are represented in a wall-mounted photograph of Ernst Hohner, grandson of the company founder. Over a period spanning decades he steered the company through the course of time. 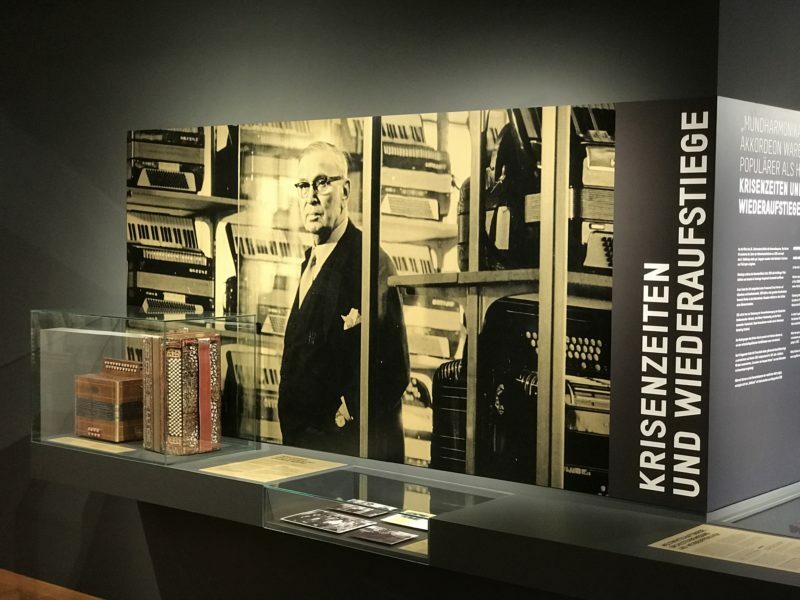 Ernst Hohner was the greatest promoter of the accordion and brought the famous constructor Venanzio Morino to Trossingen in 1928. 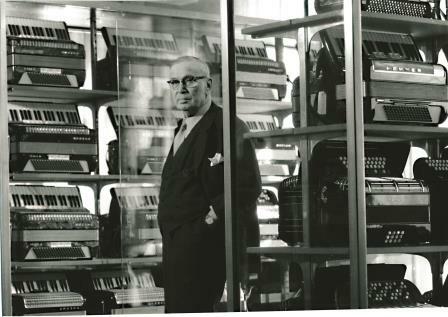 Company Director Ernst Hohner in the sample room. The Hohner Company Orchestra (1947 – 1963), touring around the world as the “Accordion Symphony Orchestra” was a particular highlight in the accordion scene. 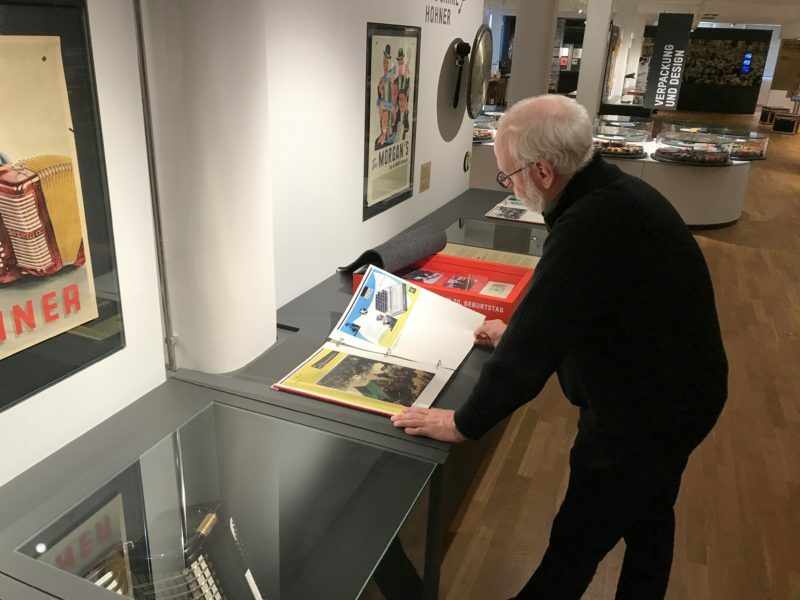 Naturally, the biographies of other great names in the accordion and mouth organ scene are also featured in association with exemplary exhibits. And of course the life story of the founder’s grandson is also depicted - not without critical comment. 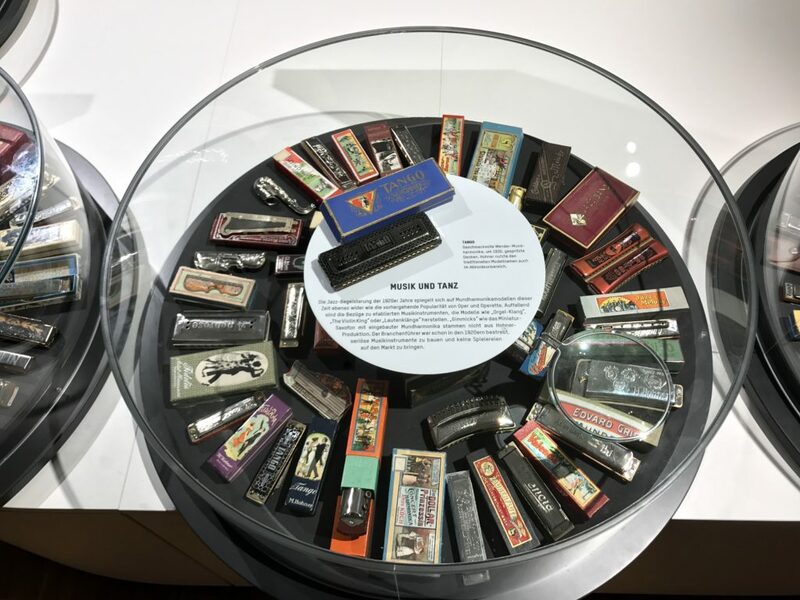 Relevant exhibits document the harmonica and accordion industry in the stormy 1930‘s and 1940‘s and in the last decade of the industry’s great heyday. The Hohner centenary celebration in 1957 is regarded as a highpoint and the turning point. 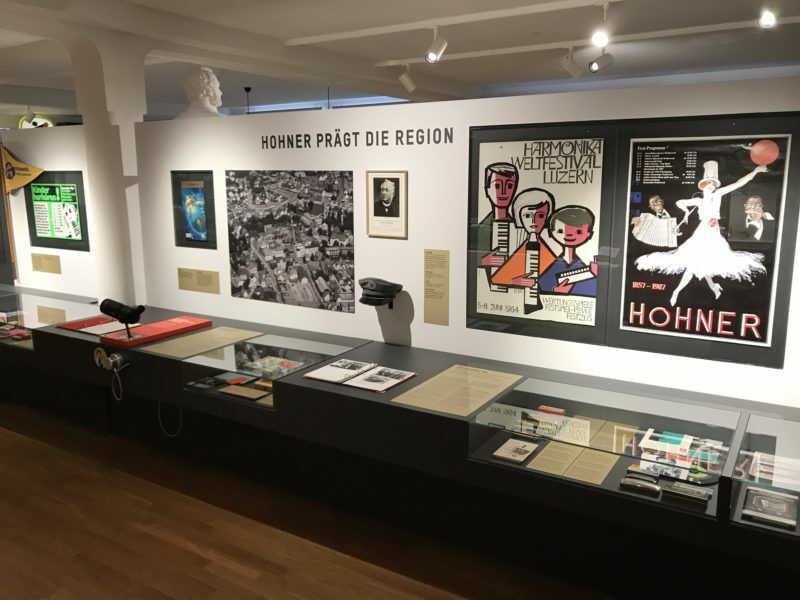 Superlatives and the existential crisis (1960 – 1990) and Globalisation and rapid market changes (1990 – 2015) are the titles of the last two sub-sections, in which the end of the harmonica boom and the “near collapse” of the Hohner Empire are documented. 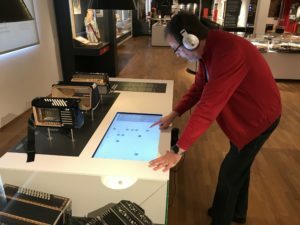 This section includes special exhibits on melodica electronic music as well as an attractive audio station with the original sound of the first instrument to be played in space (a miniature mouth organ!) and also a selection of classical examples and follow-on developments of the “Marine Band”, the most popular mouth organ of all time, placed purposefully at the end. Current websites and digital picture frames of the 21st century music scene round off the display. 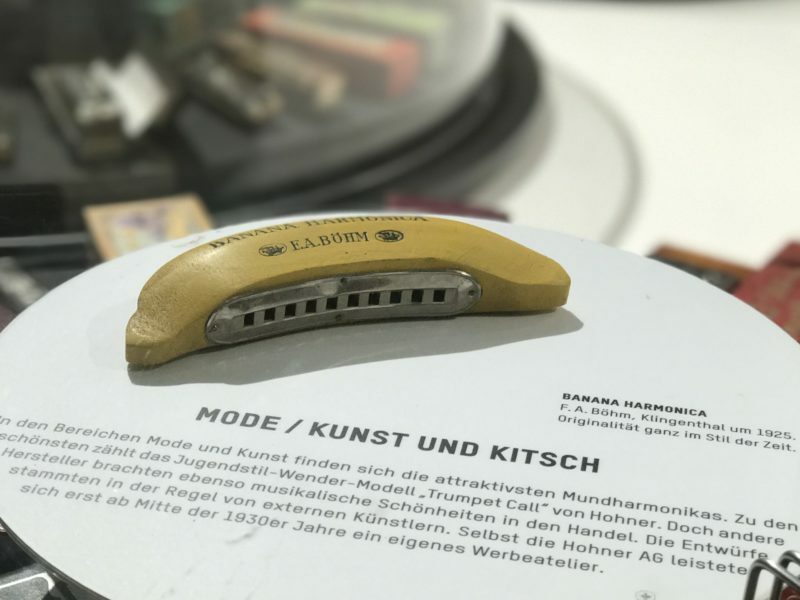 The main machines and tools used in the production of harmonicas are presented on a raised platform. The assembly and tuning of the instruments will be demonstrated for group tours and guided tours. 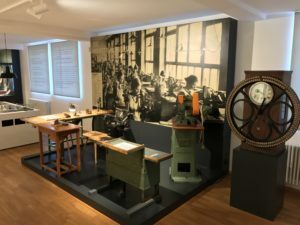 In addition, the construction and production of mouth organs and manual bellows instruments is shown on special tables. Informative short films can also be accessed. The interactive family tree of harmonica instruments is outstanding! Integrated in the table for construction and production of the accordion and operable via touch-screen function, the system allows the visitor to select and view individual instrument types and obtain useful information, as well as accessing audio samples so that the tonal diversity can be picked out. The design and packaging of mouth organs is not only a feast for the eye but reflects the spirit of the age as well. No other product was marketed so multifariously. Zeppelin models for technology enthusiasts, mouth organs for sports fans and patriots of all countries and regions, instruments/cases with political and even military association (reflecting the First World War particularly) and very much more are displayed according to theme in twelve large rotating display cabinets. 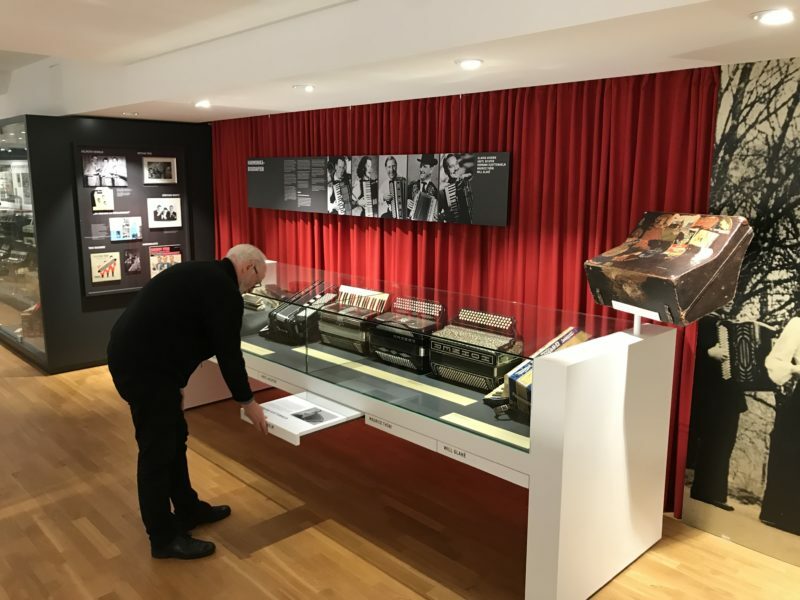 The legendary “Beatles-Harmonica” is just next door, integrated in the large display cabinet dedicated to the marketing of the industry, recognizable by the red pull-out display. One of the twelve rotating display cabinets for design and packaging. 6. Special zone for 20th century manual-bellows instruments. View of the display case 20th century manual bellows instruments. 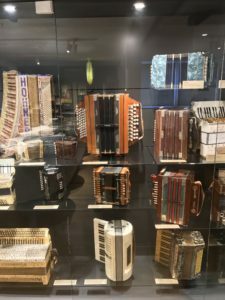 Accordions and mouth organs can be seen in many parts of the exhibition, but this giant display cabinet is reserved for almost 100 of the most beautiful and important specimens in our collection, including the largest button accordion in the world, built in 1953. 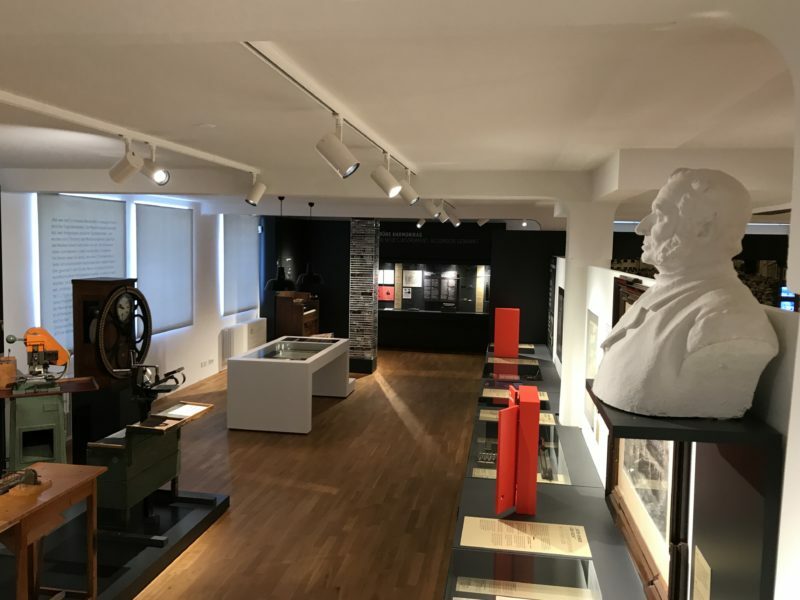 The multifunctional film room forms a special zone within the permanent exhibition (and a quiet zone) that can be reached at any time during your visit. 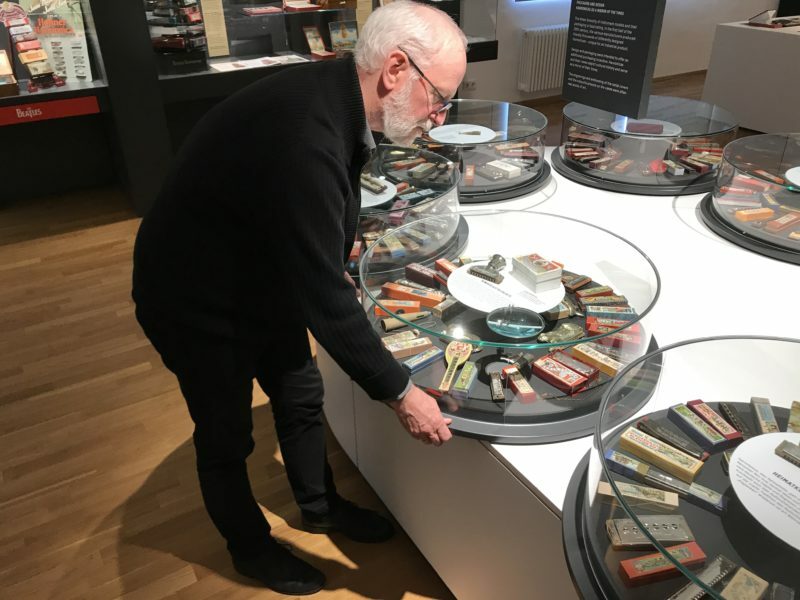 Ten film sequences showing films and excerpts from our substantial archive spanning the years from 1930 into the 60’s as well as from the great 150-year Hohner anniversary in 2007 can be accessed via mouse click. Selected film excerpts can also be shown in group tours.